I have a buttload of fudge mint cookies in my house. But that’s okay because I love fudge mint cookies. However it was once again requested that I bake tonight since there’s a cupcake deficit, so I thought of that delicious combination I love: chocolate mint, and incorporating those cookies into it. I’m always looking for new chocolate cupcake recipes. I have a bajillion (really only like 6) already that I like and have gotten good feedback on, but for me most of them were either too dry and muffin-y and were like eating straight cocoa powder, or too moist and they fell apart when taking them out of the pans. I’m like the Goldilocks of chocolate cupcakes. So I happened upon two different ones today that I wanted to try, Billy’s Bakery’s version and a version from Joyofbaking.com. I made the latter, because I did not have enough butter to make Billy’s. Heh. What kind of baker am I!? So I made ’em, frosted ’em with mint buttercream, and sprinkled ’em with crushed fudge mint cookies. Et voilà! Then in the bowl of your electric mixer, or with a hand mixer, cream the butter and sugar until light and fluffy. Add the egg and beat until smooth. Beat in the vanilla extract. Add the flour mixture and beat until incorporated. Then add the cooled cocoa mixture and stir until smooth. Evenly fill the muffin cups with the batter and bake for about 17-20 minutes or until risen, springy to the touch, and a toothpick inserted into a cupcake comes out clean. Remove from oven and place on a wire rack to cool. Once the cupcakes have completely cooled, frost with icing. 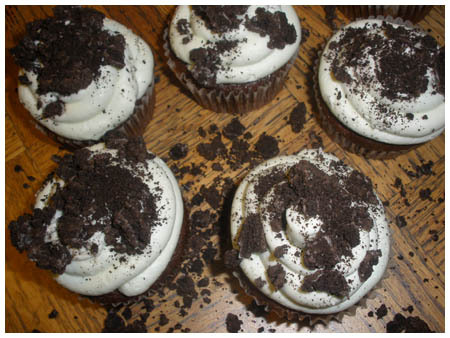 If you want flat topped cupcakes then slice off the dome of each cupcake, with a sharp knife, before frosting. Beat the shortening and butter together until well combined and fluffy. Add 4 cups of the sugar and beat for about 3 more minutes. Add the vanilla, mint extract and milk, and beat for another 5 to 7 minutes until fluffy. Add other cup of sugar if needed. Add some food coloring if desired, and mix until combined. If you don’t like that much mint you may want to add it by the ¼ teaspoon. I used a lil’ green food coloring because I’m cool like that. I used shortening to stiffen it up a bit, but also because I ran out of butter! But it was good because shortening, while incredibly bad for you apparently, also makes frosting stiffer and it pipes out amazing. 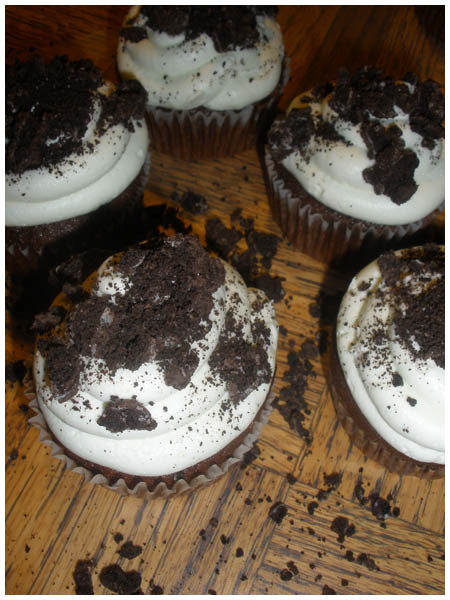 I wanted really tall spirals of frosting on these… and I got ’em! The cupcake recipe only makes a dozen cupcakes. I say only because if your family is like mine, a dozen will last maybe a day. Seriously. But its easy enough to double it. The frosting will definitely frost twice as many cupcakes as the recipe above makes, so keep that in mind. I went mile-high with it because I really love the look of big piles of frosting, but also because I had so much of it I didn’t want to waste any. 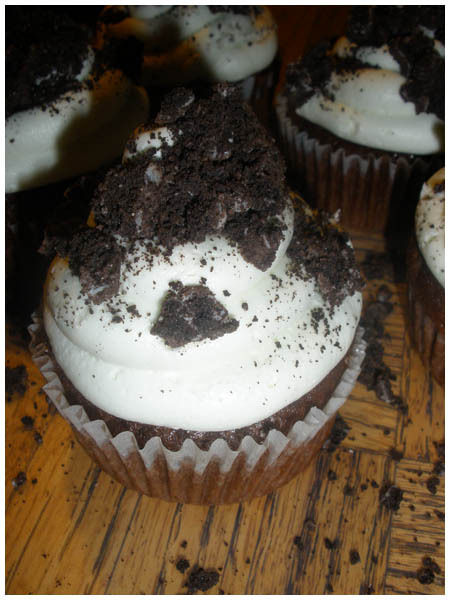 Another option for topping is using a whole cookie, or half a cookie, and just sticking it up out of the top of the frosting. Or, bake a cookie in the bottom of the cupcake liner.. it’ll get soft during baking and be an added surprise for people eating it. Previous Post Happy birthday, Grandma Dotty! to your blog via Google, and found that it’s truly informative. this in future. Lots of other folks might be benefited from your writing. ans additionally sharing in delicious. And of course, thank you on your effort!